At First Choice Seamless, all seamless gutter are custom manufactured on-site at your home. This insures quality and precision. All of First Choice Seamless installers are direct employees and not sub-contractors. You can be sure of our accountability when we install your gutters. We treat your most valuable possession (your home) as our own while we are on the job site. We DO NOT use box miters, we use strip miters Strip Miters have only one seam, Box Miters have three. 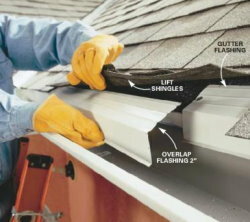 Strip miters will give your new gutter system a strong, cleanlooking installation for a more professional look. This requires more advanced installer to do correctly, while box mitres are something an inexperienced installer can accomplish. Strip mitres will make the difference in allowing us to guarantee your gutter system for life. Typical box mitre life expectancy is only 5-10 years. Gutter flashing in most areas is not a code requirement. The cities of Minneapolis and Saint Paul both require a permit and inspection of gutter flashing as part of the process to insure proper gutter installation. Most other communities have no code requirements for flashing, so it is Buyer Beware! Some installers will eliminate it from your bid specifically to show you a lower price. This will dramatically increase their profit margin while putting your home at risk. Since this is not a code requirement item, there is typically no recourse or liability in these situations once damage is done. At First Choice Seamless, we always include gutter flashing in our installations. Standard Hanger spacing on First Choice Seamless installations is 24". Some companies will space hangers 36" to 42". This results in a structurally weaker system, but may save you money. We Also use a #10 1 ½ screw Not #8. We never use nails on any installation.